Lighting, Window Treatments, Re-upholstery, Accents, Custom Bedding, and Floor Covering. Especially in the business of decor, a picture is worth a thousand words. On this website, Helen has the ability to add and manage multiple photo galleries showing various aspects of her work in an effective visual way. As with all WordPress sites, she has control of all of this content through a simple-to-use back end interface. We also set up a Google Apps email account for ease of managing her business email. 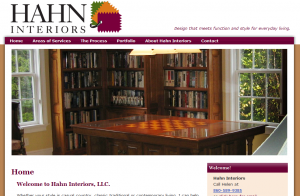 Check it out at www.hahninteriors.com!